STATE CAPITOL, PHOENIX – House Speaker J.D. Mesnard (R-17) today released the investigative report on sexual harassment allegations against Representatives Don Shooter (R-13) and Michelle Ugenti-Rita (R-23). Speaker Mesnard also announced several actions in response to the report and scheduled a press conference for 4:00 p.m. to discuss those actions. The report, which is attached, concluded that there is credible evidence that Representative Shooter violated the House of Representative’s policy against sexual harassment. The report did not find credible evidence that Representative Ugenti-Rita violated House policy. Speaker Mesnard is permanently removing Representative Shooter from all committee assignments effective immediately. Speaker Mesnard will furthermore introduce a resolution on the House Floor censuring Representative Shooter for his behavior. Speaker Mesnard will propose augmenting the House rules, which carry the force of law, to require a formal anti-harassment policy by which all Members must abide. Speaker Mesnard will also propose adding a House rule requiring a formal behavioral code of conduct for all Members. 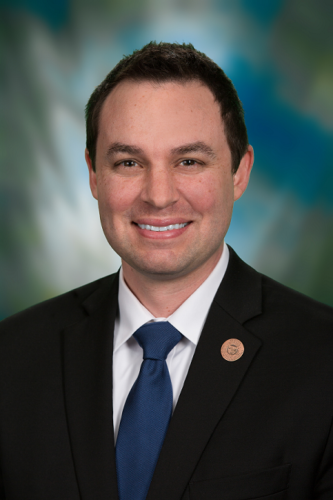 Speaker Mesnard will establish a bipartisan panel of Members to fully and transparently develop the behavioral code of conduct for House members. Speaker Mesnard, in his capacity as Speaker, will develop a code of conduct that will apply to all House staff. Speaker Mesnard will formalize a Human Resources Department for the House. Speaker Mesnard will prohibit the consumption of alcohol on House premises. Speaker Mesnard will hold a press conference this afternoon at 4:00 p.m. in House Hearing Room 1 to discuss the remedial actions he has taken. Aaron Borders is married to Shelly Borders, a fourth-generation Arizonan. They have four young children. 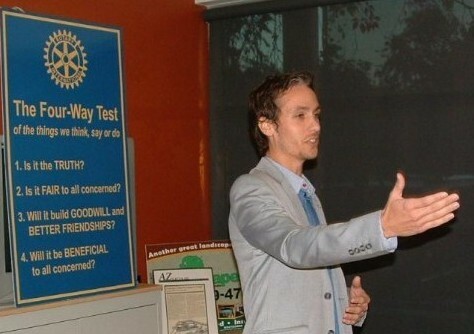 Aaron is a business owner, a board member of the West Valley Youth Sports Commission, and a licensed financial specialist. In his limited free time, Aaron enjoys serving at his church, spending time with his family and coaching his sons in football. Aaron has been endorsed by Arizona House Majority Leader-elect Steve Montenegro, Representative Darin Mitchell, and Senator Don Shooter. 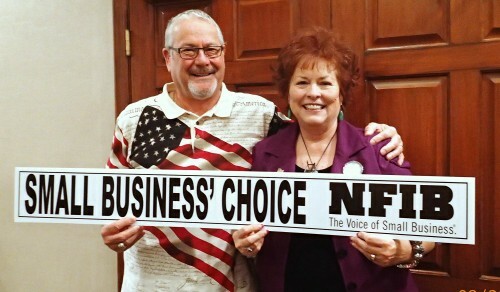 Photographed holding one of NFIB’s signature “Small Business’ Choice” campaign sign-toppers, NFIB/Arizona Leadership Council Chairman Mark Giebelhaus congratulates former lawmaker Sylvia Tenney Allen after she was selected as replacement state senate nominee by Legislative District 6 Republicans at their August 30th special meeting in Flagstaff. The extraordinary selection became necessary when incumbent Sen. Chester Crandell died in an early-August horse-riding accident after primary ballots had already been sent to voters. Mr. Giebelhaus was on hand at the GOP meeting to inform Mrs. Allen that she would receive NFIB/Arizona SAFE Trust’s endorsement. Mrs. Allen served in the Arizona Senate from 2008 to 2013 rising to the position of Senate President Pro Tempore in 2011. While in office, she achieved a perfect 100-percent score on NFIB/Arizona’s Voting Records during her four-and-a-half years in the legislature. The political action committee of Arizona’s leading small-business association today announced its General Election endorsements of 43 candidates for the Arizona Senate and Arizona House of Representatives. 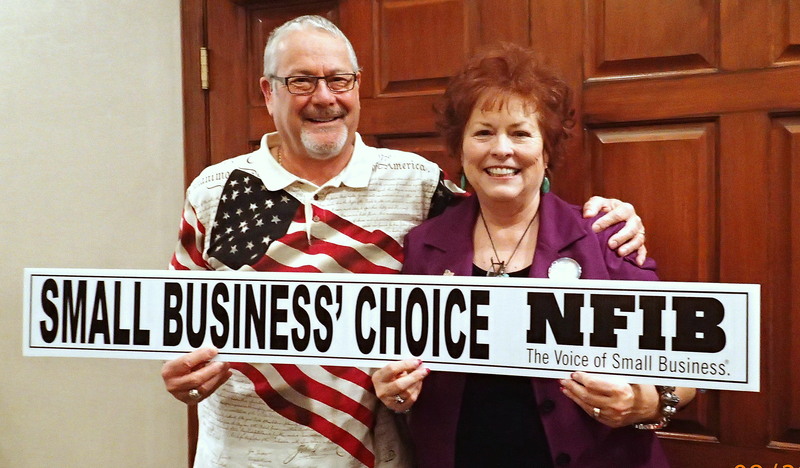 “The legislative candidates endorsed by NFIB today are proven friends of free enterprise whom Arizona small-business owners can trust to place their responsibility to taxpayers first over the interests of bigger government and its enablers,” said Farrell Quinlan, Arizona state director for the National Federation of Independent Business (NFIB). These endorsements are formally issued by the NFIB/Arizona Save America’s Free Enterprise (SAFE) Trust, the organization’s political action committee, and represent the culmination of the legislative candidate endorsement process for the small business advocacy group. In July, NFIB endorsed 42 candidates in the primary phase with all but two advancing to the General Election—Rep. Carl Seel lost his primary and Sen. Chester Crandell passed away in August. The three new NFIB endorsements for the General Election are former state senator Sylvia Tenney Allen who was selected by her party to replace Sen. Crandell in the Legislative District 6 Senate contest and House candidates Noel Campbell in Legislative District 1 and Anthony Kern in Legislative District 20. NFIB is expected to announce soon small business’ choice for governor and attorney general. For more than 70 years, the National Federation of Independent Business has been the Voice of Small Business, taking the message from Main Street to the halls of Congress and all 50 state legislatures. NFIB annually surveys its members on state and federal issues vital to their survival as America’s economic engine and biggest creator of jobs. NFIB’s educational mission is to remind policymakers that small businesses are not smaller versions of bigger businesses; they have very different challenges and priorities. The political action committee of Arizona’s leading small-business association today announced its endorsements of 42 candidates for the Arizona Senate and Arizona House of Representatives. 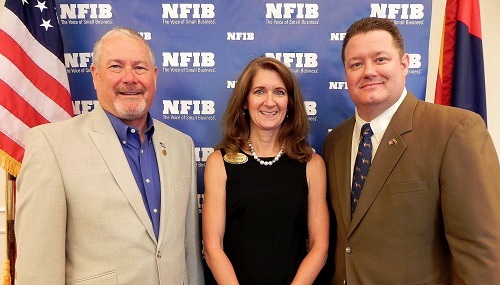 NFIB/Arizona Leadership Council Chair Mark Giebelhaus and NFIB/Arizona State Director Farrell Quinlan flank LD18 House hopeful Jill Norgaard at the small business group’s Small Business Forum this week. 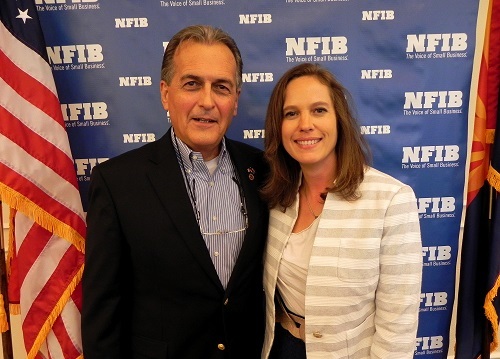 NFIB/Arizona Leadership Council member Jeff Fleetham and LD28 House hopeful Shawnna Shawnna Bolick at the small business group’s Small Business Forum this week. The principal standard used to evaluate incumbents was their voting records on 12 bills supported or opposed by the National Federation of Independent Business during the 2013-2014 legislative sessions. Endorsements for non-incumbent candidates were largely based on the quality of their answers on a questionnaire. These endorsements are formally issued by the NFIB/Arizona Save America’s Free Enterprise (SAFE) Trust, the organization’s political action committee, and represent the culmination of the pre-primary phase of the candidate evaluation process. There may be further endorsements in select legislative and statewide races after the August 26th primary elections. Why is Don Shooter Giving Government Special Treatment? Republican candidate Toby Farmer is asking State Senator Don Shooter to explain his sponsorship and support of a bill that gives the state and state employees complete immunity when they commit negligent acts on state trust lands. Sen. Shooter sponsored a bizarre amendment in the Appropriations Committee last week to a state trust lands bill. The provision, which Shooter authored, condones negligent acts of the state and its employees. Right now as written, Shooter’s proposal would give the state complete immunity in the future, for example, in tragic wildland forest fires such as the Yarnell tragedy where 19 hotshot firefighters were killed last summer in northern Arizona. Families of the victims and property owners currently have claims against the state alleging negligence. To learn more about Toby’s campaign, visit www.FarmerAZ.com. 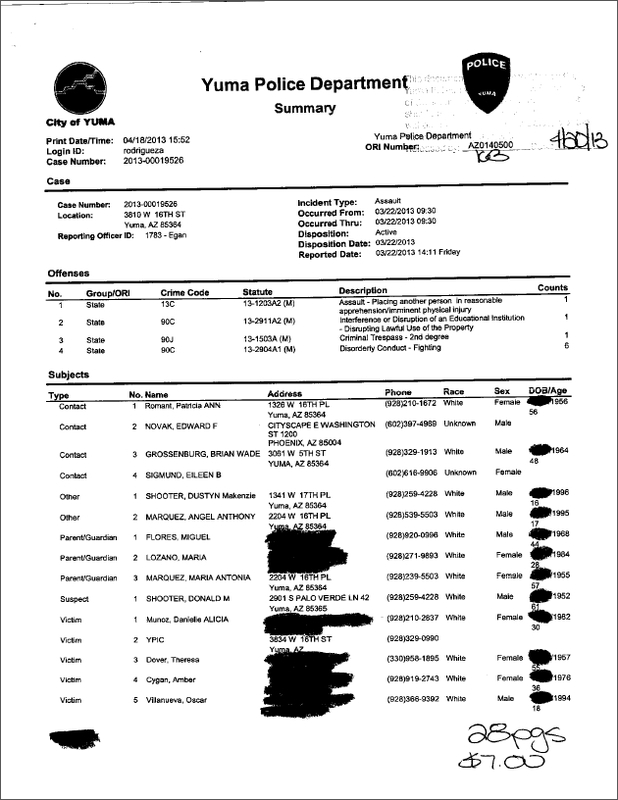 While we’re airing our dirty laundry among Republican candidates, we though you’d like to review the official Yuma police report on State Senator Don Shooter. This is probably one of the reasons why Senator Shooter continues to lose support in his race for re-election. Rumors are that the Obamacare pro-Medicaid expansion industry and Governor Brewer is helping fundraise and finance his re-election campaign. Unfortunately, those revelations won’t appear until the June 30th report in several months. This race is going to get uncomfortable for the incumbent as it probably should but as most campaign posts on Sonoran Alliance, this is where the mud flies. 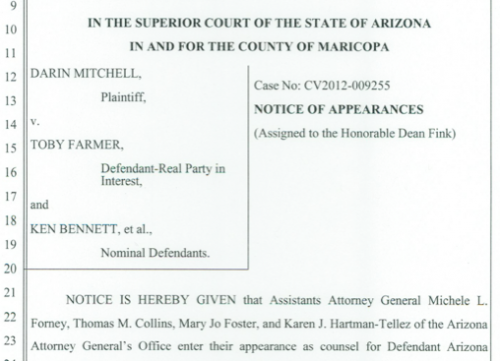 However, Maricopa County Court documents tell a much different story. According to court records, Farmer had run for office before. In fact, he was a candidate for State House in 2012 but faced legal action challenging the validity of his qualifying signatures. The nearly 30-page legal complaint documented how more than 300 of the 441 signatures filed by Farmer were invalid for a variety of reasons. The complaint also detailed how Farmer failed to specify the date of the election as required by law, opting instead for “2012”, and how Farmer refused to list his address on the petitions as required by law, opting instead for “Litchfield Park”. Court records also show that Farmer abandoned his bid hours before he was scheduled to appear in court as part of the legal challenge. 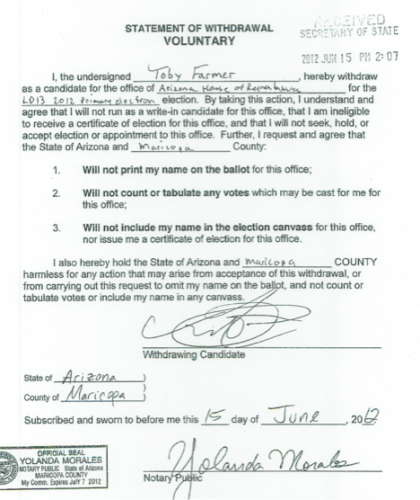 Farmer had been advised to withdraw as a candidate by Maricopa County Elections officials who had inspected his petition signatures and largely agreed with the claims made in the lawsuit. Why did Toby Farmer pretend that he was a reluctant first time candidate in 2013 when court records clearly show that he ran for office in 2012? And, when faced with questions about his 2012 run, why did Toby Farmer tell precinct committeemen at his district meeting that the reason he withdrew was because “we already had two good conservatives running (in Montenegro and Mitchell) and I didn’t want to hurt their chances.”? The petition challenge was filed by Darin Mitchell and Farmer withdrew because he knew he would lose in court. So why now pretend he withdrew to help Mitchell and Montenegro? It is time for Toby Farmer to come clean about his 2012 campaign and apologize for deliberately misleading the voters of LD13. ● More than $18,000 in travel related expenses including fuel, mileage reimbursement, auto repair, and lodging. ● Over $15,000 in legal fees, including $10,100 in fees directly related to his three misdemeanor charges for barging into his grandson’s classroom and confronting a school teacher last year. ● Nearly three quarters of the $43,000 Shooter raised last cycle came from lobbyists and other special interests who have business at the State Capitol. The Arizona Republic also uncovered that in addition to his $24,000 per year taxpayer salary, Shooter collected another $8,029 directly from taxpayers as part of his reimbursement for commuting to the Capitol to conduct legislative business. This amount is on top of the more than $18,000 he transferred from his campaign account for fuel and mileage reimbursement. If the Arizona Republic is correct, Senator Shooter would have driven over 30,000 miles in the last campaign cycle according to the legally binding reports he filed with authorities. Remarkably, that’s enough mileage to travel around the globe one-and-a-half times. Earlier this year, Don Shooter notoriously made headlines when he told a local television reporter that he wouldn’t give up free tickets from lobbyists to events like the Fiesta Bowl unless the taxpayers of Arizona gave him a pay raise. For more information on Toby’s campaign, please visit: www.FarmerAZ.com. For the first time in many years there may be an opportunity to restore some money to the State’s “Rainy Day” fund or provide some relief for overburdened taxpayers. As Chairman of Appropriations Committee, he will bring us an update on the state budget and negotiations with the Governor’s office. E-Mail Diane Douglas at azpatsfan@cox.net for your reservation or additional information. First come, first serve. You will not receive a reply unless the event is full. If you have already sent an RSVP there is no need to do so again. Thank you! (Phoenix, State Capitol)—-Senate President Russell Pearce announced today he is naming Senator Don Shooter chairman of the Senate Appropriations Committee. “Senator Shooter is a strong fiscal conservative. He works well with his colleagues and the Governor. He will put the taxpayers of Arizona first,” says President Pearce. Sen. Shooter currently serves as Chair of the Appropriations Sub-committee on Rural Issues, Education & Natural Resources. Shooter replaces Senator Andy Biggs, who is now Majority Leader in the Senate. “Senator Biggs will stay very engaged in the Appropriations process, and Appropriations Vice-Chair Ron Gould is a seasoned Senator and a longtime Appropriations member. With Senator Shooter moving into this leadership role, our Appropriations team becomes even stronger,” says Pres. Pearce.